Does someone else's problem become your own problem? If so, you may be codependant - and you may find yourself in this book. The healing touchstone of millions, this modern classic by one of America's best-loved and most inspirational authors holds the key to understanding codependancy and unlocking its stultifying hold on your life. 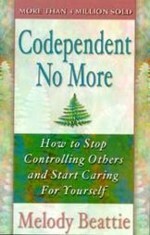 With instructive life stories, personal reflections, exercises, and self-help tests, Codependant No More has helped countless readers change their codependent behaviours and understand that they are powerless to change anyone but themselves. A pioneering voice in self-help literature, Melody Beattie has endeared herself to readers who long to healthier relationships. She has written a host of best-selling books, including Beyond Codependency, The Language of Letting GO, 52 Weeks of Conscious Contact and The Greif Club.